Amongst the many Europeans who live in Apokoronas there are several artists, musicians and writers, many of whom were artists, musicians and writers before they came to live in Crete. Several others however, had another career in a previous life in another country and found the time in retirement to pursue a lifetime ambition in another field. Owen Mullen, a newly published writer who had not just one, but two of his novels published earlier in February, does not belong to either category. I went to his house in the heart of Apokoronas, built on a slope with stunning views of the Cretan Sea to the north, on pleasantly sunny February afternoon. We sat in the spacious living room and we started to talk about his work and life in Crete, over a cup of delicious English tea and a couple of hobnobs. Owen explained how he and his wife Christine got to live in Crete. They had visited Crete for the first time 15 years ago. “We were touring Europe. We got to Athens via Paris, Amsterdam and Istanbul and then went to Aegina, Santorini and Crete” he said . “We really liked Crete, the people were great and we thought this is a really nice friendly place with great weather”. So, when they went back to Glasgow, Owen suggested they come to live in Crete, and Christine took less than five seconds to agree to the idea. Six months later they returned to Crete, bought some land, where they later built their house, and 11 years ago they moved from Glasgow to live in Apokoronas for good. Owen was a graphics designer with his own business, and a lecturer. And before that, a musician, something that explained the presence of couple of guitars on stands discretely placed in one corner of the living room. But Owen likes to try out new things. So when one morning, seven or eight years ago, “caught himself worrying about the electricity bill”, he thought about writing as a way making a living. No, he had not written anything before. Not for forty years anyway. And neither did he have a burning desire or ambition to write before then. The only other time he had written something lengthier than a shopping list was when, as a ten year old boy in school, he had won a short story competition. “It was about a little girl with a hole in her heart” Owen recalled. “At the time there was a lot in the news in Scotland about a girl born with a hole in her heart” something that fascinated young Owen. So why not try writing again ? he thought. And just like that, he did. “I wrote another short story called ‘The King Is Dead’. The first thing I’d written since primary school. When I typed the last word [Christine taught me to type] I held the pages in my hand then started to read. An hour and a half, rooted to the chair unable to believe what was in front of my eyes. For four decades I had shunned a god given gift. And as I read I started to understand why. It was awful. Not just bad. Bloody terrible” he says. At least he could tell terrible writing when he came across it. He didn’t just want to write. He wanted to write well. And he kept going. And wrote more. He wrote a mystery set in Pakistan, and a detective story set in New Orleans, places he had visited with Christine during their travelling days. And then someone suggested the obvious, setting his stories in Scotland. The resulting work was impressive. Owen now has three literary agents, at a time when other writers struggle to get one, and his two Scottish novels were published. So what are his books about? “Real ‘whodunnit‘ stories, with a twist in the tail” says Owen. Owen turned to his wife: “Christine does a lot more than correcting the grammar and punctuation. She comes up with ideas, she discusses the plot with me. We bounce ideas off each other”. The story in the first book opens with the abduction of a child from Ayr beach in Scotland, taken while her parents are yards away. “Well, Christine had that idea one day when we were in Georgioupolis and saw a couple strolling on the beach, their young child following behind looking for shells and pebbles to pick up. ‘Imagine what would happen if someone were to abduct the child’, she said”. That was how the story was born. And reading the reviews, it seems to be a really good story and a good read. Has he thought about setting one of his books on Crete? He has, but he has not written one yet. But it is still early days in the career of a writer who has been described by a literary agent as “a major new force in British crime fiction”. And maybe one of his future books will be set in Crete. In the meantime I am looking forward to reading the first two books by Owen Mullen, a promising Scottish writer who chose to make his home in Apokoronas. 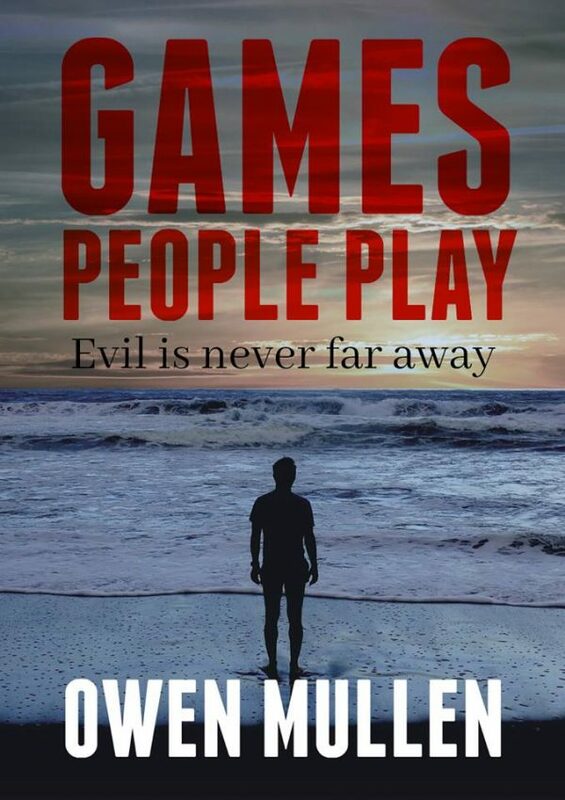 Games People Play and Old Friends and New Enemies by Owen Mullen published by Bloodhound Books are available from Amazon in paperback and Kindle form.